Events, as they say in politics, have conspired to force the President to reshuffle his Cabinet, to sharpen Government and to shine. 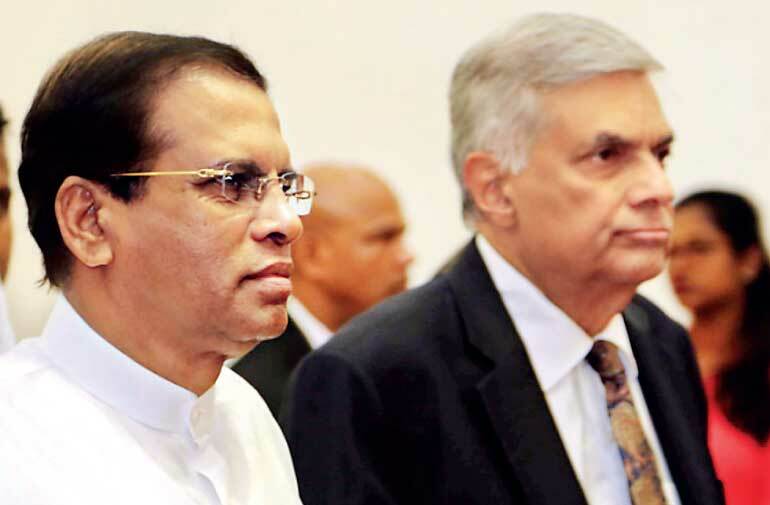 According to a weekend newspaper it is reported that President Sirisena has finally decided to reshuffle his Cabinet of Ministers and that a few new faces are expected to be appointed to the Cabinet while a few changes in existing portfolios will also be enacted. The Government needs a thorough shake-up and changing a few ministers will not serve that purpose. After three years in office, some ministers have delivered and some lack ideas and have become stale, detached and complacent. Others are simply out of their depth and should be replaced. When a President or Prime Minister reshuffles his Cabinet for the first time since assuming office many questions are generally asked as to why portfolios need to be reassigned and why new people have to be elevated to full ministerial rank. When Lee Kuan Yew was once asked as to why he decided to reshuffle his Cabinet in just 24 months, the Singaporean Prime Minister said he was amazed and somewhat amused over the puzzlement. He said it was a mid-term fine-tuning to inject new life into his Cabinet that had been formed two years before. As Cabinet reshuffles go, Lee’s reshuffle according to him was a very modest rearrangement to prevent his ministers becoming complacent and to move out the non-performing ministers. The questions raised after Cabinet reshuffles are not unexpected. After all, Cabinet reshuffles, are an intriguing affair. At least for one thing, they demonstrate the power of the Head of State. Perhaps, this is only one decision that he is expected to decide on his own - the other being the date of the general election - consulting only the Prime Minister and very close associates, if at all. Interestingly, reshuffles therefore tend to be highly secretive affairs, thus adding to the fascination. Even in the case of a modest change. Often the people who are promoted to ministerial rank are told only on the day itself. The other reason for wide interest is that more often than not Cabinet reshuffles are heavily laden with hidden motives and agendas. On the other hand, at the other extreme, there are those more appropriately called ‘Cabinet shakeouts’, to clear the deck for a new takeover. A few though tend to overdo it, like in 1986, when South Yemeni President Ali Nasir Muhammad gave a whole new meaning to the term ‘shakeout’. However, not all ministers took their dismissals lying down during that shake out. There are of course less civilised versions of the ‘shake out’. Like the one initiated by former British Prime Minister Harold Macmillan in 1962, which has been dubbed the ‘Night of the long knives’, when half the Cabinet was replaced. Mrs. Margaret Thatcher, who was dubbed the Iron lady, had her own version in mid-1989 called the ‘Night of the Long Hat Pin’. However, it had one other objective, which was met sooner than she had expected. In her biggest reshuffle, she promoted her favourite, John Major from Treasury Secretary to Foreign Secretary, in a move widely seen by many at that time as making him the heir apparent. John Major, the successor to Mrs. Thatcher, too found a reshuffle convenient when a few days after becoming Prime Minister he reshuffled the pack to show that he’s his own man. Mini-reshuffles do not of course belong to any of the above categories. But it is not without its political significance. On the other hand the public expectation of President Sirisena’s proposed reshuffle is to get the Government to deliver and inject fresh hope. If it is not done with agreement, realism and pragmatism it can lead to further chaos within the Government. It is often said that the Cabinet in most countries wields tremendous power and authority. However, in Sri Lanka, despite the recent amendments, the President still wields substantial power and authority, and few nations in the world have power so highly, concentrated in one office as in Sri Lanka. It is a sobering thought that the man at the head of the Cabinet, i.e. the President, has the sole responsibility and discretion finally of deciding who belongs to it. This is how most governments work today. In fact Mrs. Thatcher in the ’80s had more power than the Soviet President Gorbachev to decide on the men and women charged with running the country. In itself, this is not necessarily a bad thing. Strong leaders have of course made a big difference, for example Singapore under Lee Kuan or Britain under Mrs. Thatcher. However, what is equally very important is to have very strong and pragmatic men and women, preferably educated, with a commitment to national service in the Cabinet to advise the Prime Minister or the President, and in some instances to act as a foil. Needless to say, in the end, the only valid reason to change a Cabinet line-up is to strengthen it or inject new life into it for the benefit of the country. In our case, it is to fulfill the January 8 mandate. The Government came to office advocating the benefits of a smart, clean and sustainable economy. Many people bought into that vision. Hopefully if the changes are done with a clear set of objectives and based on performance it will provide ministers and their teams with an opportunity to display renewed solidarity and a commitment to deliver. But, for all this to happen first the Government structures must be made fit for the purpose. (The writer is a thought leader).